myUCA enables a safe and secure method of online submission so that everything is stored securely by the university and accessible online 24/7. There are a number of tools for online submission, so choosing the correct one will depend on what type of work is submitted and what the course team intend doing with the work. NOTE: In some cases, a number of tools are used for their different features, an example being a technical dissertation (over 20mb) might contain some complex diagrams and formatting but still need checking for plagiarism; the student submits the finished work in its entirety to the Assignment tool and just the text content to the Turnitin Assignment. The Grademark tool enables tutors to mark student work using an online grading form. The grading form replicates the UCA assessment form by enabling tutors to provide feedback against assessment criteria. 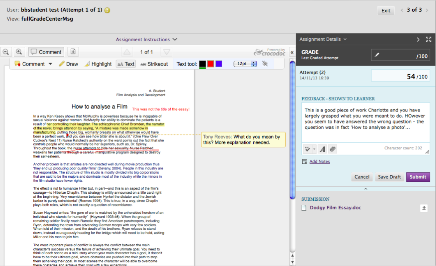 Tutors can also write directly onto the students’ work and add a longer paragraph of text. The following short video demonstrates how to use Grademark in myUCA. The myUCA assignment tool enables students to submit a wide range of artifacts. If students are creating photos, moodboards, InDesign files, Powerpoints or any other type of digital file, they can submit it online in their course or unit area. Tutors can then view and assess the work by adding formative comments, highlighting passages of text and providing a longer passage of summative feedback. This short video explains how to set up an assignment submission box in myUCA. Once students have received their paper feedback form they often discard it. This significantly limits the long-term effectiveness of feedback and makes it difficult for both students to track their progress and development. Creating a myFeedback page in your course area provides a place where you can store a PDF of students’ feedback for each assignment. This provides an online record for students of their written feedback and makes it possible for academic support staff (Learning Enhancement tutors, Learning Support Assistants) to view the written feedback that has been provided by tutors. 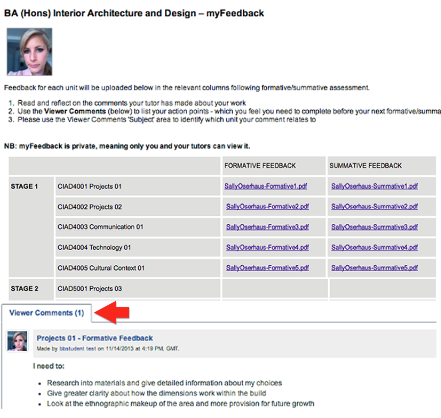 The myFeedback tool also enables students to add comments underneath their feedback record. This provides a way for students to reflect on their feedback, for example a tutor might ask a student to add a series of action points before a feedback tutorial. Encouraging students to reflect and act on their feedback can help them to take control of their learning and support their development as independent learners. Audio feedback provides an effective alternative to written feedback and has been shown to improve students’ understanding of their feedback. The Grademark tool in myUCA enables tutors to record up to 3 mins of voice comments against a submission and this can be ideal for formative assessment of student work. This short video demonstrates how to record audio feedback in Grademark, and this case study by the University of Brighton provides a more detailed look at audio assessment and online learning.